7 Comments for "Quick Chili"
I made this for a senior group and it was way too spicy. How disappointing. We try to keep our seasoning amounts on the mild side since it is easier to add more than to take some away. It's a good reminder that chili powder is a blend and can vary in spiciness depending on brand. And chili powder as a blend is different than ground red chilies. If someone made this at home and found it to be too spicy for their taste, there are some options. If ingredients were available, they could double the recipe except for the chili powder. Adding some of the additional veggies suggested in the Notes section might also help. Or diced potato or even cooked rice would help dilute the spice. Extra chili could be frozen to use for a quick meal at a later date. I didn't have crushed tomatoes or chilli powder, so I used garlic powder, salt, and several heaping spoon fulls of salsa instead. Turned out great and kiddos, who are normally picky eaters, loved it! We used cubed butternut squash (and a little canola oil to saute it) instead of ground meat at a food pantry demonstration and everyone loved it! It was delicious and added a pop of color! We also added canned corn and a green bell pepper too. It was a big hit! 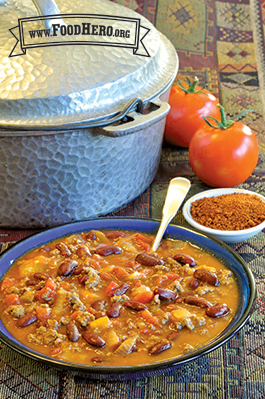 This is a great basic chili recipe. I add ground cumin and red chili powder for extra spice! I'm loving these quick recipes! Yum Yum! Delicious and fast! I think I am going to try to add some peppers, onions, and carrots next time.